It’s that time of year for resolutions and revolutions. Last year at this time, women took center stage using the social media hashtag of #MeToo and #TimesUp, where their voices and activism created a female-empowered movement against sexual harassment heard round the world. 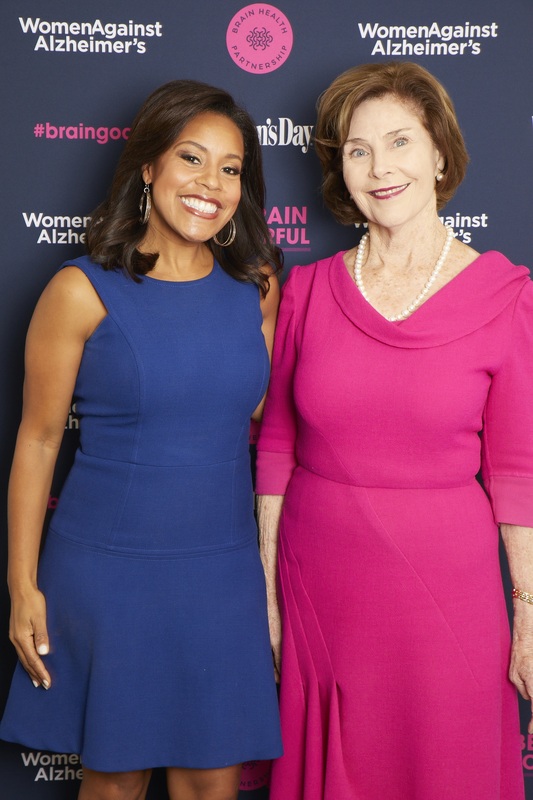 This year, a brain trust comprised of influential women, including former First Lady Laura Bush, and led by WomenAgainstAlzheimer’s, hopes to harness the power of women to create a movement addressing our future’s most pressing health epidemic: Alzheimer’s disease. The “Be Brain Powerful: The Campaign for Women’s Brain Health” launched by the WomenAgainstAlzheimer’s group, part of the UsAgainstAlzheimer’s (UsA2) network, is one initiative in a multi-pronged, multi-year approach to create a public health campaign to bring together healthcare systems, policymakers, the public and private sectors to treat brain health as an integral part of overall health. About 5.7 million Americans today have Alzheimer’s disease with another 16 million family members providing care for them. The societal and economic impact of the disease is crippling. With no cure or effective ways to slow the disease, more than 14 million will have Alzheimer’s by 2050 with a projected national cost of $1 trillion. A recent survey conducted by WomenAgainstAlzheimer’s found 7 in 10 women want more information about tracking, measuring and enhancing brain health and 90 percent of women feel that taking care of their brain is as important as taking care of the rest of their body. Yet awareness and education for Alzheimer’s and brain health are woefully behind other women’s health issues such as breast cancer prevention and diagnosis and heart disease risk. For instance, the Alzheimer’s Association says most women don’t realize that women in their 60s are almost twice as likely to develop Alzheimer’s during the rest of their lives as they are to develop breast cancer. And women are not the only minority group disproportionately affected by Alzheimer’s. Certain racial groups face a bigger threat as well. According to the Alzheimer’s Association, African Americans are almost twice as likely as non-Hispanic whites and Latinos 1.5 times as likely as whites to have the disease. The Be Brain Powerful web site uses the six pillars for better brain health from the Cleveland Clinic including practice good nutrition, stay active, get adequate restful sleep, control risk factors such as high blood pressure and high cholesterol, exercise your body and your brain and stay connected to friends and family. According to UsAgainstAlzheimer’s, research is beginning to show that more than one-third of dementia cases could be prevented or significantly delayed by addressing lifestyle risk factors. The campaign will run various Brain Health Challenges throughout the year encouraging participants to maintain their involvement in brain healthy activity. The campaign, which includes social media and online tools, has also added a seventh pillar about making an impact. WomenAgainstAlzheimer’s believes women, especially the Sandwich Generation, are the chief medical officers of their families. They influence the health of both their children and older parents and WomenAgainstAlzheimer’s believes women’s central role in their family’s health will galvanize this campaign from the typical good health tips into a movement with momentum for the future. “We know from heart health that awareness is a game-changer and that women, armed with information and actions, will lead us to a brain healthy world that improves and saves lives,” added Steinbaum. In the 1990s, women created a major political and societal movement with breast cancer awareness and then again in 2000 as the catalysts for women’s heart health. These movements were on the heels of other societal shifts led by female change-makers such as patient’s rights and consumer protections and rights. It was through these public health education campaigns backed by all sectors of our society – from policymakers to health care professionals to employers to corporations to local communities –that led to substantial positive changes in overall women’s health. For instance, a 40-year history of awareness for self-exams, early detection improvements and treatments of breast cancer have seen survival rates rise from 75 percent in 1975 to 91 percent or better today. And, while heart disease is still the No. 1 killer for women, the knowledge about risk factors and the difference in heart attack symptoms for women vs. men have increased from 30 percent in 1999 to 56 percent in 2014. In addition to being the chief medical officers for families, women are also the chief lifestyle officers. Whether it’s breast health, heart health or brain health, lifestyle factors are a crucial component to possibly changing the trajectory of the disease and identifying paths of prevention. One of the main objectives for the Be Brain Powerful campaign is to change women’s perception that Alzheimer’s only happens to the elderly and to empower women to take more responsibility in their personal risk throughout their adult lives. While age is a risk factor for Alzheimer’s where one in three seniors will die with the disease (only 5 percent of those with dementia have early onset Alzheimer’s which is diagnosed before age 65) we know those with the disease typically have been living with Alzheimer’s for 15-20 years before symptoms appear. Her involvement with the Be Brain Powerful campaign is about both her personal experience watching the disease that took her father, and as a mother and grandmother where she knows future generations are facing an increasing Alzheimer’s prevalence that has overwhelming health, societal and economic impact. In a statement for the Be Brain Powerful campaign, Mrs. Bush emphasized the importance of taking care of our brain health early before you age. WomenAgainstAlzheimer’s has assembled a VIP group of female thought leaders and influencers along with media partners such as Woman’s Day to join the former First Lady in the Brain Trust including: NBC News anchor Sheinelle Jones; former Health and Human Services Secretaries Donna Shalala and Kathleen Sebelius; president and CEO of the United Nations Foundation Kathy Calvin; Kim Campbell, wife of the late country music legend Glen Campbell who died with Alzheimer’s; world-renowned soprano and opera singer Renee Fleming who spearheaded the Sound Health Initiative backed by National Institutes of Health and National Endowment of the Arts; labor and civil rights activist, Delores Huerta; Kay Coles James, public official who worked in President George W. Bush’s administration and is president of the Heritage Foundation; Jo Ann Jenkins, CEO of AARP; human rights activist Kerry Kennedy; Judy Lichtman, senior adviser for the National Partnership for Women and Families; political consultant Mary Matalin; Lauren Miller Rogen, screenwriter and film director who created along with her husband Seth Rogen, Hilarity for Charity to raise Alzheimer’s awareness among millennials and Jay Newton-Small, Washington correspondent for TIME Magazine and co-founder/CEO of MemoryWell. This collection of powerful and empowered women are committed to seeing brain health as part of the national dialogue. By raising awareness, the campaign hopes to address the survey result that 8 in 10 women believe we should be talking about brain health more. They are also dedicated to removing the stigma of Alzheimer’s, in the same way women removed the stigma of breast cancer. It is clear our society is not prepared for the speed and scale of Alzheimer’s. These ‘wonder women’ and the WomenAgainstAlzheimer’s organization hope to lead the next health revolution by adding brain health to the culture of health women have pioneered in our society. Sherri Snelling is founder/CEO of Caregiving Club, a strategic consulting, communications, connections and content company focused on helping the nation’s 65 million family caregivers find the health and wellness balance between caring for others and self-care. She is the author of A Cast of Caregivers – Celebrity Stories to Help You Prepare to Care and is a contributing columnist on caregiving for PBS Next Avenue, Forbes.com, Huff Post, USA Today and Stria News. Sherri's caregiving and aging consulting and content creation (webinars, podcasts, videos, blogs) clients include AARP, Keck Medicine of USC, UnitedHealthcare, LifeCare, CareLinx, grandPad, First Republic, Wells Fargo and QVC. She was the chairman of the National Alliance for Caregiving, served on caregiving advisory groups for the White House Middle Class Task Force, CMS and CDC and is currently a board member of the Alzheimer’s Association – Orange County chapter. She also serves as ambassador for the Caregiver Monday campaign, creates the Me Time Monday videos in support of caregiver health and wellness and is a nationally sought speaker.